My inspiration to bake as a child was my dad. As my dad worked nights, we often baked together at weekends. I remember successes, failures, a lot of laughter and love. A passion that I am also passing on to my children who also love to join me in the kitchen is to make biscuits or cakes. My dad is also to blame for the families carb addiction. 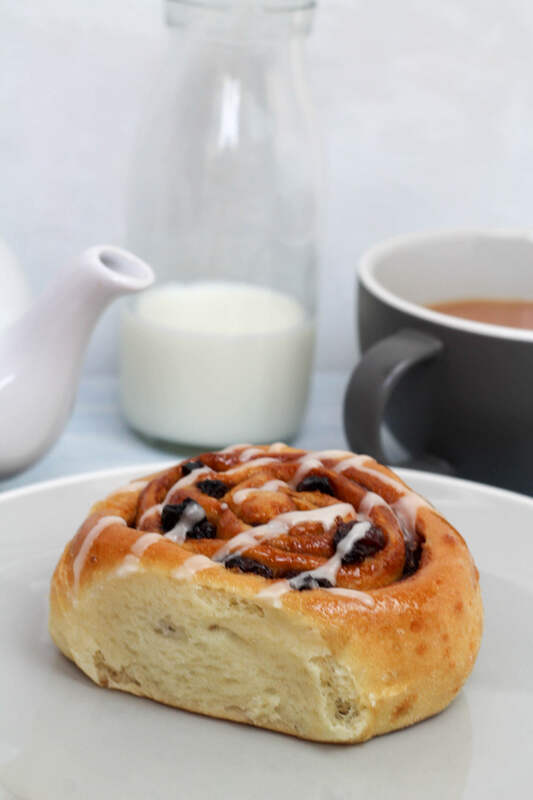 He could never walk past a bakery without popping in for a piece of bread pudding, Belgium bun or his favourite Chelsea bun. 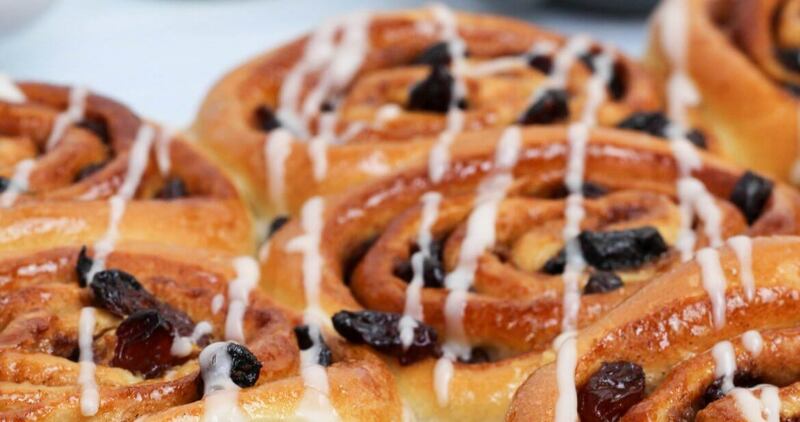 I have been wanting to make Chelsea buns for a long time. However I never seemed to have the time and if honest I have never been that confident in bread making or yeasted doughs, so have often put off making them. I think this stems back to the first loaf I remember my dad and I making. It was so hard that archaeologists will find it in the back garden of our old house in a 100 years time and wonder why anyone would make a house brick out of flour and yeast, it was that solid and dense. My bread over the last 6 months has improved greatly, due to some good tips from some bread guru friends. The main eureka moment in my bread making was when I was told the phrase “wetter is better for bread dough”. Historically my doughs were always firm and dry, which really limits the rise and gives a dense loaf. I now no longer fear wet dough and with some decent kneading it becomes beautifully smooth and elastic. 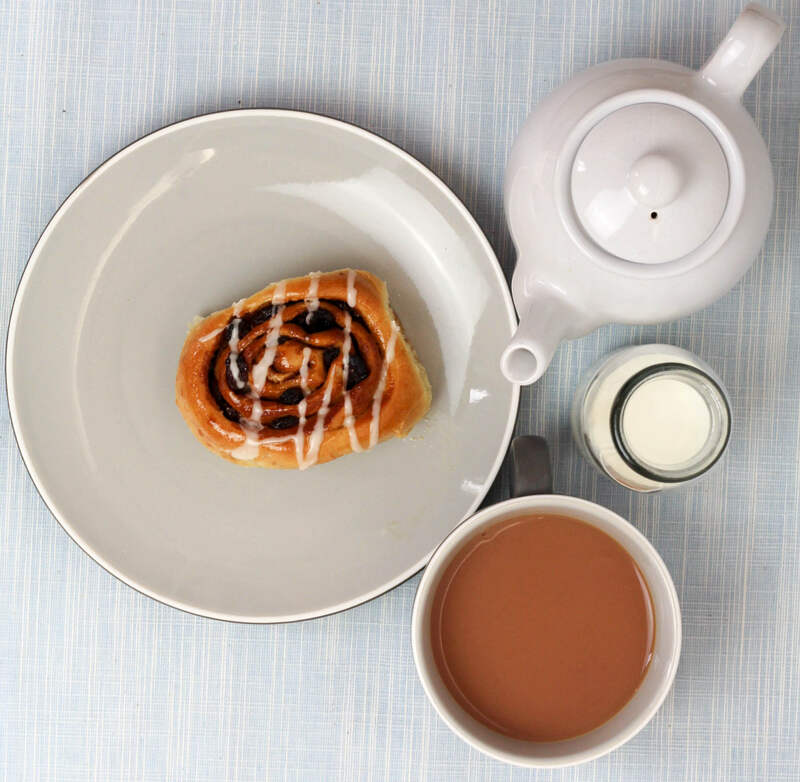 So it was time to jump into the Chelsea buns. Those who know me know that I see candied peel as the devils food, so my fruit of choice was an even mix of sultanas, dried cranberries and sour cherries. 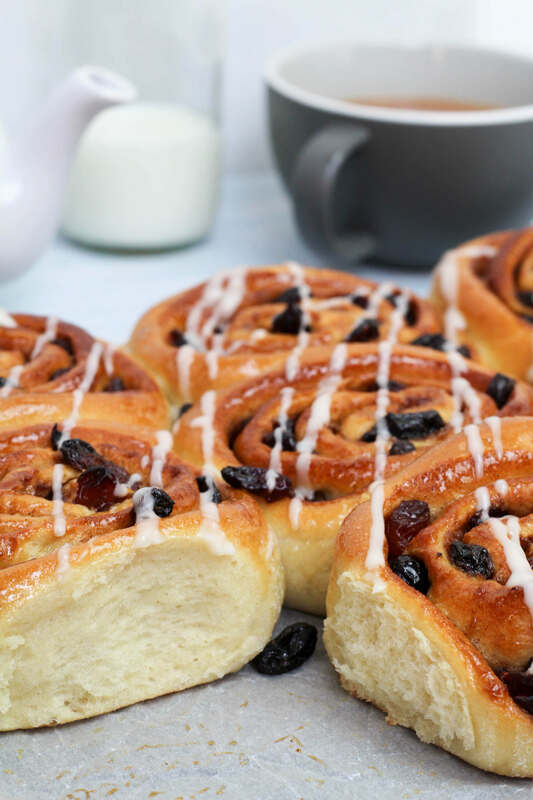 These were a lot easier than I thought they would be to make and were absolutely delicious, I baked them on a Sunday so, when my parents popped in for a cup of tea, they could sample a lovely warm, sweet, fluffy, cinnamon and fruit filled bun. They went down a treat. They will now be a regular in my repertoire and a great base to tweak flavours with different fruits and spices. 1. Warm milk and butter in a small saucepan until the butter melts. Allow to cool to room temperature and beat in the egg. 2. Sift flour into a large bowl or the bowl of a stand mixer with the dough hook attached. 3. Add the yeast to one side of the bowl. Add the salt to the other side of the bowl. This helps stop the yeast being retarded by the salt. 4. Make a well in the centre and add the milk, butter and egg mixture. 5. Knead for 10 minutes by hand or 7 minutes in a stand mixer with a dough hook until the dough is smooth and elastic. 6. Transfer the dough to a large oiled bowl and cover with Clingfilm. Allow to proof until double in size (1-2 hours). 7. Line a deep sided roasting tin with baking parchment. 8. Gently tip the dough on to a lightly dusted work surface. Gently roll into a large rectangle about 5mm thick. 9. On the edge closest to you, squash the very edge of the dough all the way along so it sticks to the work-surface. This will help with rolling later. 10. Melt the butter and brush evenly over the dough. 11. Mix the brown sugar and cinnamon together and sprinkle all over the dough. 12. Spread the fruit evenly over the dough. 13. From the edge that is furthest away from you, tightly roll the dough , slightly pulling it away from you to keep tension against the edge that is stuck to the work surface. 14. Trim the ends so that you have a neat cylinder. Then cut into 9 equal slices. 15. Place the slices into the tin, leaving a little room for them to prove for a second time. Cover the tin with lightly oiled cling film and leave to prove for 30-60 minutes until double in size. Preheat the oven to 190c/170c Fan. 16. Bake for 20-25 minutes until risen and golden brown. Remove from the oven and brush over the maple syrup whilst the buns are still warm. 17. Move the buns to a wire rack to cool. Once cool, mix the icing sugar and maple syrup to a thick pouring consistency and drizzle over the cooled buns. Warm milk and butter in a small saucepan until the butter melts. Allow to cool to room temperature and beat in the egg. Sift flour into a large bowl or the bowl of a stand mixer with the dough hook attached. Add the yeast to one side of the bowl. Add the salt to the other side of the bowl. This helps stop the yeast being retarded by the salt. Make a well in the centre and add the milk, butter and egg mixture. Knead for 10 minutes by hand or 7 minutes in a stand mixer with a dough hook until the dough is smooth and elastic. Transfer the dough to a large oiled bowl and cover with Clingfilm. Allow to proof until double in size (1-2 hours). Line a deep sided roasting tin with baking parchment. Gently tip the dough on to a lightly dusted work surface. Gently roll into a large rectangle about 5mm thick. On the edge closest to you, squash the very edge of the dough all the way along so it sticks to the work-surface. This will help with rolling later. Melt the butter and brush evenly over the dough. Mix the brown sugar and cinnamon together and sprinkle all over the dough. Spread the fruit evenly over the dough. From the edge that is furthest away from you, tightly roll the dough , slightly pulling it away from you to keep tension against the edge that is stuck to the work surface. Trim the ends so that you have a neat cylinder. Then cut into 9 equal slices. Place the slices into the tin, leaving a little room for them to prove for a second time. Cover the tin with lightly oiled cling film and leave to prove for 30-60 minutes until double in size. Preheat the oven to 190c/170c Fan. Bake for 20-25 minutes until risen and golden brown. Remove from the oven and brush over the maple syrup whilst the buns are still warm. Move the buns to a wire rack to cool. Once cool, mix the icing sugar and maple syrup to a thick pouring consistency and drizzle over the cooled buns. Previous Post: « The Ultimate Cornbread Muffins. I love the glazing with the maple syrup! Great idea. I’m going to make these in a few minutes. Thanks for sharing. Loved your story and your blog. I saw it on Twitter.